and stirring up anger produces strife. The second and third lines are familiar enough in any culture: grab and twist someone's nose and naturally blood will come pouring out, or stir up someone's anger (or as we say in America, "press someone's buttons") and you will have a fight on your hands. However, the first line describes something that would have been familiar to most people throughout history, but unfortunately is not familiar to citizens in first world countries today. In this instance, we get the short end of the stick. Like many good proverbs, the saying goes from concrete examples which illustrate a truth to an abstract concept that parallels that truth. Churning milk, wringing someone's nose, and stirring up anger are all actions that are done intentionally. You don't accidentally make butter. As you can see in the photo, you have to work at it. And you wouldn't accidentally grab someone's nose and give it a firm twist. So it seems that this proverb is referring to intentionally doing things that you know will make someone angry. You can accidentally stir up someone's anger, but this proverb is referring to intentionally working at it. In addition, all three of those actions produce an expected result every time you do them. Each time you churn milk, you will get a separation of the fatty parts of the milk from the watery parts (the whey). It is a scientific fact. It is the same with twisting someone's nose: every time it will cause them to bleed. So the wisdom shared in this proverb is that the natural consequence of stirring up someone's anger is a quarrel. If you intentionally get someone angry with you, then you will have a fight on your hands. So the lesson here is not to stir up someone's anger in the first place. If you don't want the fight, don't cause the anger. 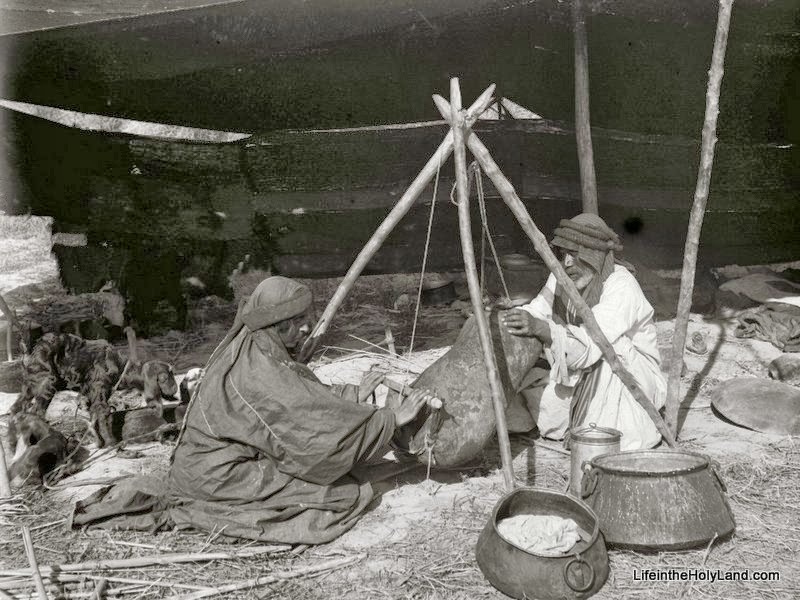 But secondarily we learn that if our local grocery store happens to run out of butter, we can make our own with three sticks, some rope, a goatskin, some goat-milk, and little bit of effort ... but let's hope things don't come to that. This photograph and over 600 others are available in Volume 6 of The American Colony and Eric Matson Collection and can be purchased here for $20 (with free shipping). The excerpt was taken from Oded Borowski, Daily Life in Biblical Times, Society of Biblical Literature: Archaeology and Biblical Studies, no. 5 (Atlanta: Society of Biblical Literature, 2003), which can be purchased here. 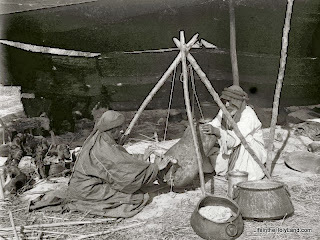 An additional image of someone churning butter with a goatskin container can be see here on LifeintheHolyLand.com. I am surprised to see two men pictured at this task, having thought it would be the work of women typically.